The trailer of Vikram starrer, Anand Shankar directorial Iru Mugan is released today, the 2nd August along with the songs. 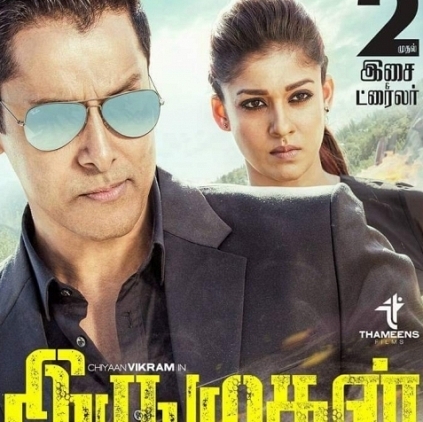 If a trailer of a film is considered to be a sneak peek of what the film has to offer, Iru Mugan appears to be a wholesome commercial thriller with all the necessary embellishments. There is action, music, romance, thrill and also some kind of investigation with drugs, mafia lords as accessories with the seat of action being exotic overseas locales. Hero Vikram appears to be in two roles, one that of a RAW agent and the other in an effeminate character, the revealing of this is a little surprising. He also appears in a nurse avatar, a beautiful one at that. Heroines Nayanthara and Nithya Menen seem to have meaty portions with Thambi Ramaiah and Karunakaran in key supporting roles. The visuals of RD Rajasekar are stylized to the maximum and Harris Jayaraj’s music renders a perfect foil. In all, the 2.17 minute trailer supplies enough fodder to fans and movie buffs. Now the wait for the film begins! People looking for online information on Anand shankar, Iru Mugan, Iru Mugan trailer review, Vikram will find this news story useful.